The following patterns for sale were developed as a result of numerous requests from my students. Sometimes students were unable to attend the classes I offered, and therefore requested a pattern for the project. I have kept the instructions simple and clear and hope that you will enjoy making and using these beautiful quilts. All the necessary support you need by email or toll free phone!!! A wonderful QUILT made by you to cherish and pass down in your family!!!! As soon as we receive notification of your payment from Pay Pal you will receive an email from us with the pattern attached as a PDF file. The I Spy Quilt Kit will be mailed to you via ExpressPost. Contact Me and I will answer them. Need a quick baby gift?? 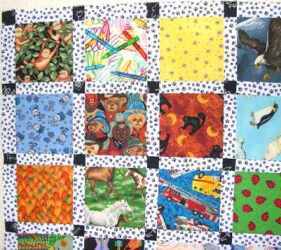 This adorable kids quilt goes together quickly and easily. The novelty squares are all precut ready to sew, you only have to cut the sashing and cornerstones and put it together. This kit is made of 100% cotton fabrics. everything you need for the quilt top. You only need to purchase the backing and batting to complete this project. Fabrics may not be exactly as shown. I wanted to show my true colors on Canada Day, and came up with this striking arrangement of blocks. 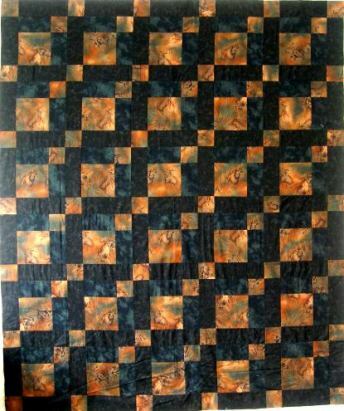 This two color quilt has been very popular, with its simple maple leaf blocks and strip pieced sashing. 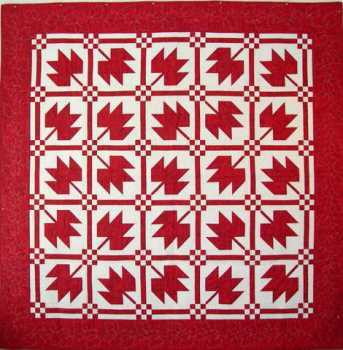 This pattern contains a Maple Leaf Cookie recipe. Enjoy your cookies while you work on your quilt! 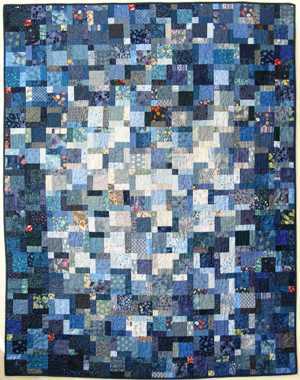 Size = 84" by 99"
This Tennessee Waltz quilt was made from tons of blue scraps, with a single background fabric. 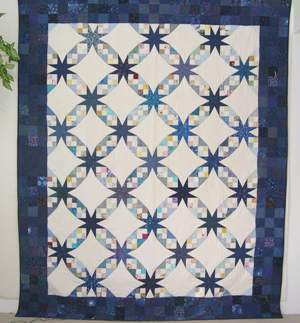 Even the border is pieced from scraps, and it looks fabulous! The combination of two different blocks creates the illusion of curves, but without the curved piecing. 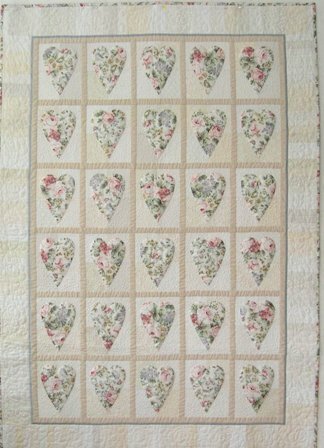 You needn't be a master quilter to create this beauty! Size = 58" by 74"
Is a great way to use up those scraps and turn them into something beautiful! This is one of my most popular patterns for sale!! Size = 45" by 52"
This simple quilt pattern made up of pairs of rectangles set on point is especially scrumptious done in blues and purples. 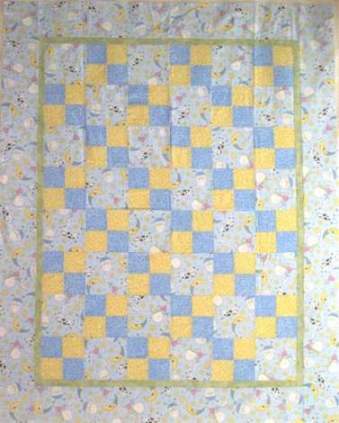 This quilt looks great hanging on my studio wall, but wouldn't it also be wonderful for a special newborn. Size = 43" by 62"
This is one of my favorite quilts! It is so soft and soothing to look at and I love anything with hearts on it. Size = 50" by 62"
I will be adding more of my own patterns for sale as well as other interesting patterns to this page on a regular basis. Check back often.